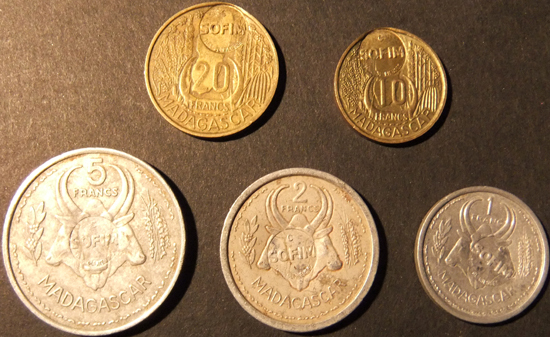 Hilmar J. Herzberg (email: congo-hilmar@gmx.de), numismatist living in Madagascar, just reported these nice countermarked tokens, as having circulated in Glorioso Islands in the 1950s. Glorioso Islands are composed of two lushly vegetated coral islands (Ile Grande Glorieuse and Ile du Lys) and three rock islets in the northern part of the Mozambique Channel. They are now part of the French Southern and Antarctic Lands. 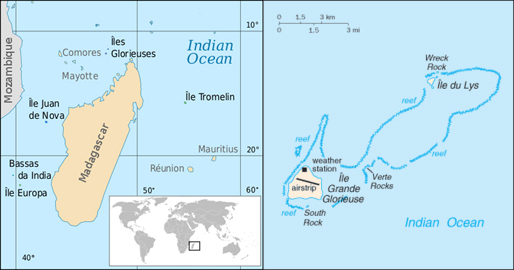 They are also considered part of the Scattered Islands in the Indian Ocean, which also include Bassas da India, Europa Island, Juan de Nova Island and Tromelin Island. They were named and settled in 1880 by a French man, Hippolyte Caltaux, who established a coconut plantation on Ile Grande Glorieuse. They became a French possession in 1892 when captain Richard of the Primauget made a formal claim. Nowadays Madagascar continues to claim sovereignty over the islands. 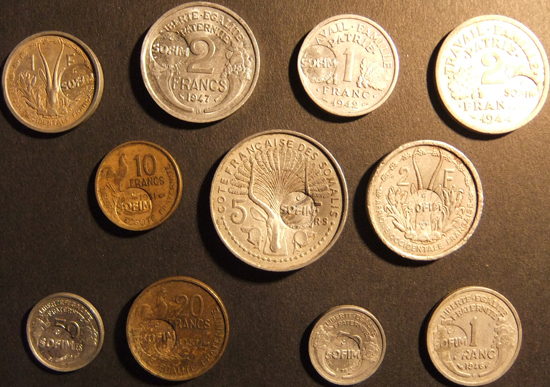 These tokens were countermarked probably in the mid-1950s from the SOFIM (Societe Francaise des Iles Malgaches) operating coconut plantations on the islands from 1907-1958, when all economic activities ended. 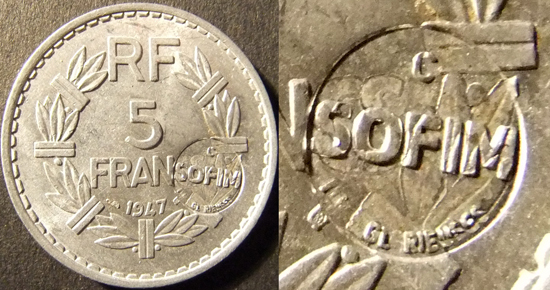 The round seal of 8.50 mm bears the company name in the center, the islands name on the bottom and a "C" on top, probably standing for "coco" or "copra". The number of tokens issued must have been rather limited, because only a few workers from Seychelles, Mauritius and Comoros were employed to harvest up to 80 tons of copra every year. Further research is under way.